Thank you for coming to my quilting blog! I’m Mrs. So & So. I love quilting and am THRILLED that this year has meant moving my quilting from a hobby to my job. It is a delight to go to my sewing room and studio and call it work. 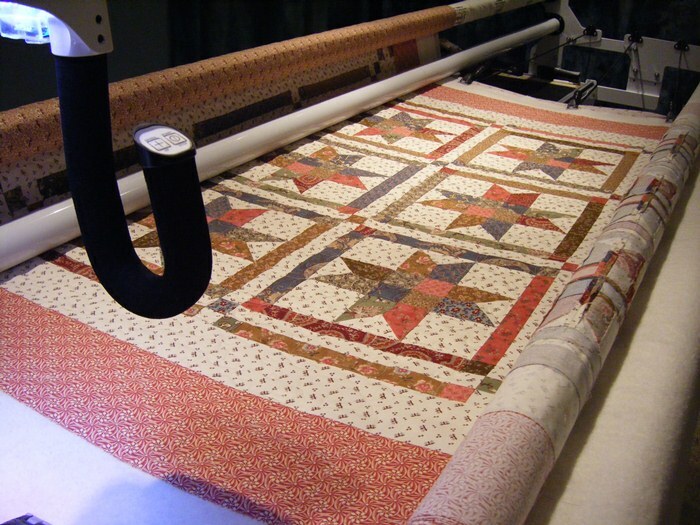 I do quilting for those who have already pieced or appliquéd their quilt top (custom long-arm quilting) but I also make quilts for those who don’t quilt at all or just don’t want to handle making a bigger quilt (start-to-finish quilting). As I complete projects, I’ll post photos here in the blog section of the website. I plan to add pages with Gallery photos as well as information on how to prepare your top for quilting or what to think about when having a quilt made for you. For now, there is a bit about me on the Contact page. You can find the other pages of the site along the top bar of this page. I hope you let me know you’ve found me by leaving a comment. If you ask questions in the comment section, I’ll reply to you in the comments as well as to your email if you’ve included it. If you are on Facebook, I hope you’ll find Mrs. So & So and like my page! Wow! A new blog! How exciting! Wow! That is all I can say. What a beautiful jo you did on both of the quilts shown. I love the border quilting on the argyle socks quilt too. Looks wonderful! Blessings on the new venture. Yes, I knew your name right away! Keep me posted on your status, Jenn! Nice site, Joyce. I’m going to forward the URL to my daughter-in-law, Michelle. She calls herself a fabric artist. Says she isn’t good enough to call herself a quilter. Personally, I think she does a great job! Anyway, congratulations, and I’ll look forward to more posts. Wow!!! Look at you sew, you old so and so!!! Like Mrs. So & So on Facebook!